Brush the corn ears with olive oil and set aside until grill is hot. In a small bowl, combine the sour cream, lime juice, cumin and 1/2 teaspoon of salt. Whisk until well-combined and creamy, taste for salt, cover and keep chilled until ready to use. Cook the corn for about 20 minutes, turning as needed. Remove from heat and let cool slightly. Spread the cotija cheese onto a flat plate, set aside. 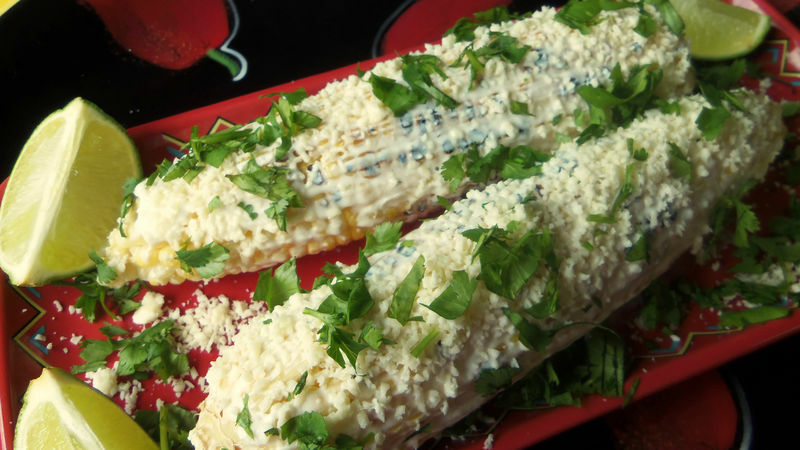 Brush the ears of corn with lime crema, roll them through the cotija cheese and sprinkle with cilantro. Serve right away. Insert a small bowl upside down into a larger bowl, hold the grilled corn on the cob steady onto flat side of small bowl and using a sharp knife, remove the kernels. They will fall right into the larger bowl. Corn is such a versatile food. It can be enjoyed freshly steamed or grilled, and in both savory and sweet dishes. Elote asado or grilled corn on the cob reminds me of visiting my family during summer vacations in Mexico. I remember walking through the small plazas where you would commonly see street foods of all kinds, like tacos, tamales, raspas and, of course, elotes asados.